When worlds really do collide! When I was a kid, one of my favorite movies was "When Worlds Collide", about a rogue planet that collides with Earth, killing everyone (except for a few who escape on rockets). Yeah, maybe not so much. It turns out, worlds really do collide. And we can see the shrapnel. Binary stars are stars that physically orbit each other. They’re extremely common, but there are many types. One special kind are where the stars are very close together, like only a few million kilometers apart. Note that your average Sun-like star is well over a million kilometers in diameter, and you’ll appreciate that’s a pretty tight pair. Not only that, but there’s a further subgroup of these binaries called RCVn (short for R Canes Venatici, the star that serves as the prototype). These are older stars, where at least one of the pair has swollen up as it begins to become a red giant. In these cases, tidal evolution has forced the stars to rotate at the same speed they orbit each other, forever showing each other the same face. Astronomers used the Spitzer Space Telescope to observe 10 such close-knit pairs. What they found was surprising: three of the stars showed a significant excess of infrared light. We know how much IR these kinds of stars should give off, and these three systems were clearly overachievers. Typically, when we see a star with too much IR, it means it has lots of dust around it. Dust warmed up by the star will emit IR, adding its light to the star’s. That’s seen quite a bit around young stars. But these RCVns are old, really old. Where would their dust come from? Yeah. Check the title of this post. As the two stars orbit each other, they shed mass through a stellar wind, like the Sun’s solar wind. As they lose mass they get closer together, and that changes their gravitational effect on any planets that might orbit them (and we have detected planets orbiting tight binary stars). This shifts the planets’ orbits, and no good can come of that. In fact, as the orbits shift so much they can cross each other, and can cause the planets to collide. The energy in such a collision would dwarf the sweatiest nightmares of any Hollywood writer — or religiously-motivated apocalyptic preacher, for that matter. 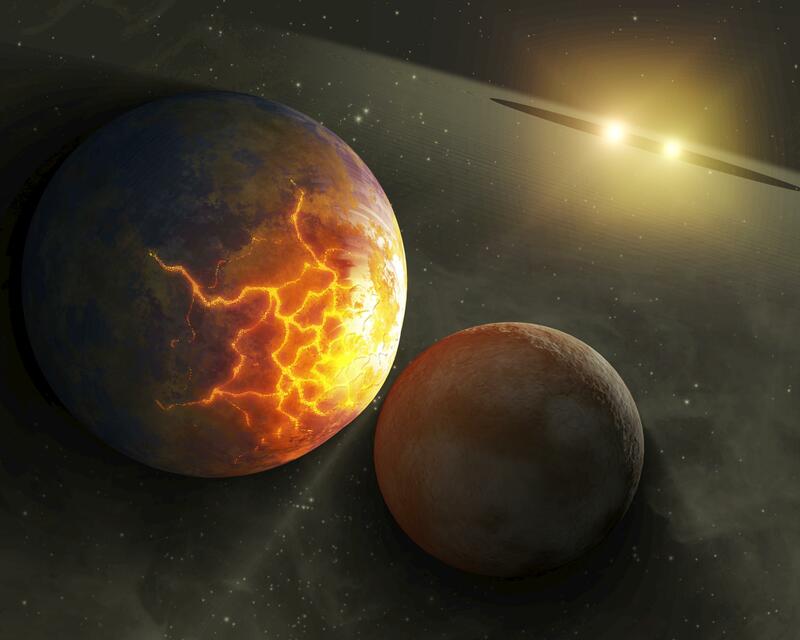 The two planets, each massing sextillions of tons, would ram each other at speeds of 20 or more kilometers per second. The energy released would be trillions of times that of all our nuclear weapons combined. What would that look like if you were standing on one of those planets? Imagine: the twin suns, so close they appear to almost touch, set toward your western horizon. As dark rises to the East, so does the rim of a vast disk. After an hour, it clears the horizon: a disk of light in the heavens so bright you have to squint, and so big it spans half the sky. It’s a rogue planet, and only a year before it was barely more than a brilliant point of light in the sky. Now it looms so large you feel you could fall into it. A strong earthquake shakes the ground as they have for the past few days; the result of the titanic tidal stress induced on your planet from the other’s gravity. On the other planet, with your naked eye, you can see networks of hundreds of massive cracks lit dull red from magma, the tides from your home world stressing and tearing apart the interloper. The disk grows as you watch, blotting out the majority of the sky by the time it sets a few hours later. The suns rise, and happily you’re on the side of the planet facing away from the location where the two worlds will touch. You’re spared the actual sight of the catastrophe. When the shock wave from the collision finally reaches you, it marches across the landscape like a mighty god, like an angry god, like a hungry god, destroying everything underneath. What follows is an earthquake literally too large to measure: one that rips out the top hundred kilometers of the planet, totally removing the crust, and utterly wiping out billions of years of planetary and biological evolution. It takes hours, but when it’s done, the two planets are gone. They are smashed, pulverized, surrounded by an expanding cloud of billions of gigatons of vaporized rock that’s sent sleeting out into space. Some time later, what’s left is a white-hot sphere — the merged remains of the cores of the two worlds — surrounded by glowing debris, boulders the size of moons, and enough dust to choke the entire planetary system for millions of years.This dust forms a disk around the star… and a few hundred light years away, we would see it as a blip of extra infrared light. Perhaps this scenario lacks the hero-destroys-the-evil-villain of a good space opera, but it does have the advantage of being real. Still, "When Worlds Collide" was pretty close! And "Star Wars" had the right idea… but the wrong planet. Alderaan was Princess Leia’s home, which was utterly destroyed by the Death Star. 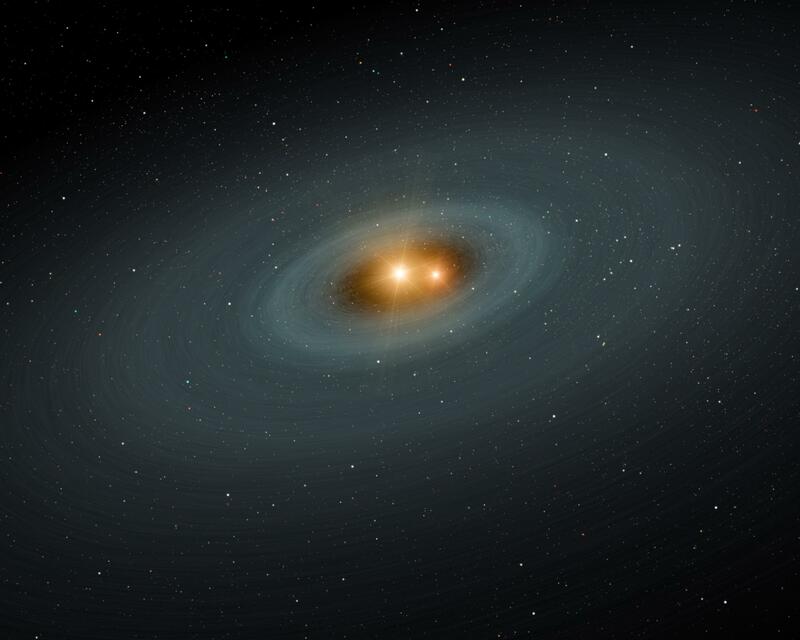 Tatooine, however, was a planet orbiting two stars apparently in a close orbit… and now we know how that turns out.